If you are looking for free but high quality wallpapers for your Windows Phone, look no further than Windows Phone 7 Wallpapers. This site is relatively new but already has an impressive collection of wallpapers in a wide range of categories. What makes the site unique though is how you download the wallpapers to your phone. Most sites require that you download the wallpaper image that you want then sync it to your Phone via Zune to get it on your device. 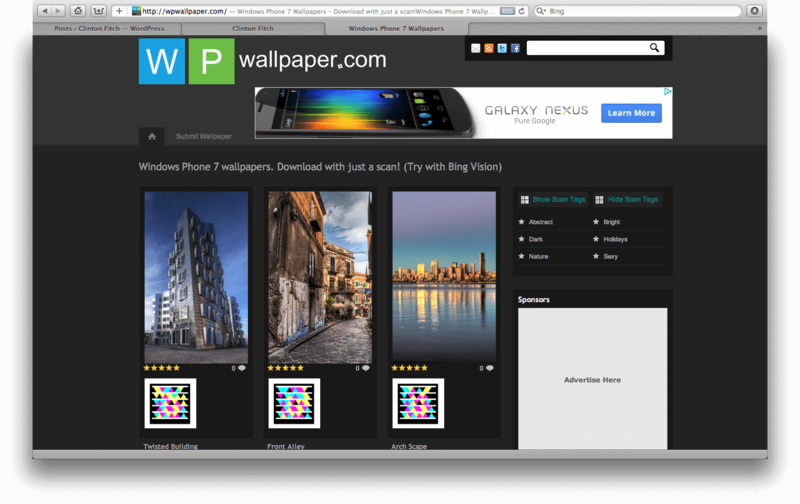 WP 7 Wallpapers for has made it much easier. Each wallpaper image has a Microsoft Tag image next to it. By using the Microsoft Tag App on your Windows Phone or Bing Vision on your Windows Phone running Mango, you can scan the tag and download it directly to your phone. Quick and easy! To be sure there are some wallpapers offered on the site that are a bit risqué so parents should be aware. Overall the quality of the wallpapers is impressive and the collection is growing rapidly.